A 4 mile walk from Hammersmith tube station to Ravenscourt Park (District line). The walk can be extended by exploring Ravenscourt Park or returning to Hammersmith Station. Follow signs to the Apollo (via subway). The Hammersmith Apollo was built as the Gaumont Palace (seating 3560) by Robert Crombie in 1932. This Grade II* listed building is one of the few to retain its working cinema organ. The Ark is a prominent building designed by Ralph Erskine in 1992. Hammersmith & Fulham Archives are located in The Lilla Huset building which was part of the Ark development (limited opening by appointment). There are buildings of the Guinness Trust to the left and Peabody Building opposite. Right into Chancellors Road then walk through Frank Banfield Park to the left into Playfair Street. This open space, originally named Chancellors Park, was created as part of the housing clearance of Elmdale and Playfair Streets in 1974. Landscaping began in the summer of 1975 and later that year the park was renamed in honour of Frank Banfield, Mayor of Fulham, who died in March 1970 after a lifetime of public service. The park was extended in 1979-80 across Distillery Lane to Chancellors Road. In 2008, the park underwent a major transformation. This latest refurbishment has modernised the site and provided attractive facilities for the local community through improved landscaping and reconfiguration of the site entrances and boundary. Left at Winslow Road. Cross Fulham Palace Road and go right. Go through the first gates of Charing Cross Hospital and bear left through the garden. Walk to the right of the building through the car park into Dunstans Road and go right. From here there is a view of the rear of LAMDA, Colet House and St Paul's Studios. On the right is Margravine (Hammersmith) Cemetery, opened in 1869. Over 89,000 burials took place but many were laid under grass in the 1950s to create a park. Three entrance lodges and the non-conformist chapel remain. Barons Court Station has attractive tilework of 1905 (see plaque on corner). Cross Talgarth Road and look back. St Paul's Studios were designed in 1891 by Frederick Wheeler for 'bachelor artists'. Number 151 is Colet House of 1885, originally art studios, later an annexe to the Royal Ballet School and now home to The Study Society. Beyond this is LAMDA. The Hammersmith & West London College was built on the site of St Paul's School. 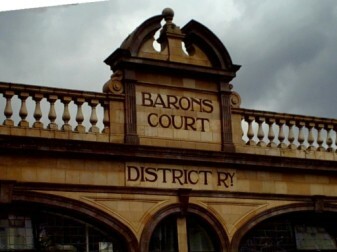 Barons Keep is a 1930s development. There are some remaining buildings of St Paul's School designed by Waterhouse in 1881-5. Opposite Colet Court was the junior school, converted to offices in 1990. On the corner of Colet Gardens, Latymers occupies the site of the Red Cow coaching inn. Further along are the mainly Victorian buildings of the Convent of Nazareth House. Return along Hammersmith Road and go left at Brook Green. St Joseph's Almshouses and Holy Trinity RC Church were built in 1851. St Paul's Girls School was established in 1904 by the John Colet Foundation and built on the site of the Grange, home of Henry Irving 1881-9 (plaque). There have been a number of additions to the original building. Opposite is Ecole Francaise in Queen Anne style and further along the former Hammersmith and West Kensington Synagogue of the 1890s is now a Chinese church. Cross Shepherds Bush Road and the green to the Tesco store. This was built on the site of the Osram Works, developed from 1893 to manufacture electric light bulb filaments. Most of this was demolished in 1988 and only the 7 storey tower of 1920-1 remains. Go south along Shepherd Bush Road. The factory range on the right was built as a Ford service depot and showroom in 1915-6. The police station of 1938 is by Donald McMorran. Opposite the Carnegie Central Library of 1904-5 was designed by Henry T Hare with sculpture by Schenck including statues of Milton and Shakespeare in the niches. The Sacred Heart High School was originally commissioned from JF Bentley by St Thomas's Seminary in 1868. The main buildings were completed in 1881 and the chapel in 1884. The convent took over in 1893 and established a girls' school to which have been added other buildings. The former fire station was built in 1913-4. The Hammersmith Palais has now closed. To the right in Beadon Road is the frontage of the Hammersmith & City line station, rebuilt in 1908. The Swan Hotel was built 1900-2. The auditorium of the Lyric Theatre by Frank Matcham (1895) was reconstructed in the King's Mall development of the 1970s by R Seifert & Partners. Go south along Queen Caroline Street, keeping on the right hand side. St Paul's Church was built in 1882 by Roumieu Gough and JP Seddon to replace a 17th century chapel of ease. Opposite the frontage of the early 18th century Bradmore House was retained on convertion to a bus garage in 1913. The building is now a restaurant. 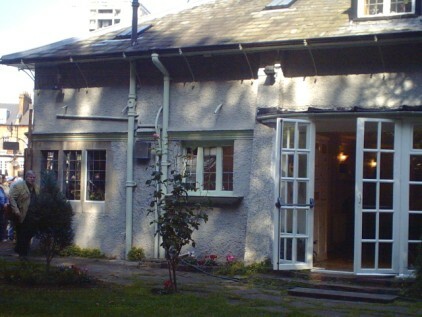 Temple Lodge was the home of the artist Sir Frank Brangwyn (1867-1956). The Peabody Buildings (1920s) received a direct hit from a V1 in August 1944. To the left in Crisp Road are the Riverside Studios. The former warehouse, once used by the BBC, is now an arts centre. At the end of the street was Queen's Wharf, site of engineering works. There are pubs and fine 18th century houses. Furnivall Gardens were laid out in 1951 for the Festival of Britain and enlarged in 1957. They are named after Dr FJ Furnivall (1825-1910) a supporter of adult education who founded the National Amateur Rowing Association in 1891. They replaced a badly bombed area of poor housing and small factories known as Little Wapping. This was also the site of Hammersmith Creek, an outfall of the Stamford Brook, which had a thriving fishing industry until the early 19th century. A walled garden marks the site of the Friends' Meeting House, destroyed by a V2 rocket. There is a view of the 1939 town hall building by E Berry Webber across the Great West Road. The Dove pub was a former coffee house and next door was the Dove's Press & Bindery (see plaques). Opposite is Sussex House of c1726. At number 26 Kelmscott House (1780s) was the home of Sir Francis Ronalds (who invented the electric telegraph), author George MacDonald and later William Morris. The coach house is now occupied by the William Morris Society [website]. Rivercourt House of 1808 now houses Latymer Preparatory School. The site was that of a house with large gardens where Catherine of Braganza lived intermittently 1686 - 92. The Corinthian Sailing club, in Linden House, was founded in 1894. The riverfront was formerly Victorian oil mills, suceeded by a vitamins factory in 1933. The gardens further along are on the site of the West Middlesex Water Company premises (founded in 1806). Hammersmith Terrace of the 1750s has 3 blue plaques. Number 7 was the home of Emery Walker (printer & antiquary) and has a preserved Arts & Crafts interior. It is now owned by a trust [website]. The Black Lion pub to the right has an unusual ghost story. St Peter's Church was designed by Edward Lapidge in 1827. The sculpture 'The Leaning Woman' is by Karel Vogel (1959). Left along the south side of St Peter's Square then right through the gardens. The square was built about 1825 by George Scott and the garden was originally private. 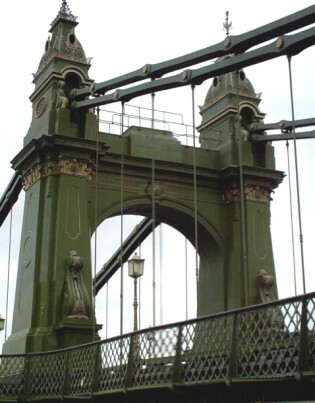 It was purchased by Hammersmith Council in 1915 to prevent development. The statue is 'The Greek Runner' by Sir William Blake Richmond (1879). Right along St Peter's Villas. Right at Black Lion Lane. Left along St Peter's Road. St Peter's School was built in 1849. Left at Standish Road. Right along Theresa Road. Left at Beavor Lane. Cross King Street and go right. Palingswick House is a late Victorian building which previously served as a school and a children's home. It now houses a Kurdish museum, library & archive (open to the public by appointment). Numbers 200-224 are 18th century. The main buildings of Latymer Upper School are of 1895 by G Saunders with later additions. Opposite is the Polish Centre. The park occupies the site of a moated house called Palingswick Manor where Edward II's mistress Alice Perrers lived in the 14th century. A new manor house was built in 1650 and sold to Thomas Corbett in 1747. He changed the name to Ravenscourt. In 1812 the house was owned by George Scott who developed St Peter's Square. The garden was designed by Humphrey Repton. The house and and 30 acres of grounds were sold to the MBW in 1887 to serve as a public library and park (laid out by JJ Sexby). The house was destroyed by incendary bombs in 1941 but the stables now provide refreshment facilities. To return to Hammersmith continue along King Street. Two inter-war buildings are numbers 111-5 built for British Home Stores in 1937 and the Cannon Cinema of 1936. The town hall of 1938-9 is by E Berry Webber with extensions of 1971-5. The Salutation Inn of 1910 by AP Killick has colourful tiles. The auditorium of the Lyric Theatre by Frank Matcham (1895) was reconstructed in the King's Mall development of the 1970s by R Seifert & Partners. The Borough of Hammersmith & Fulham has produced walk leaflets including Ravenscourt Park and Brook Green which can be downloaded in pdf format. Go to www.visithammersmith.co.uk and click on 'Walks' then 'Walkwell Routes'.